PPG Industries, Inc. PPG will showcase its Teslin label stock at Labelexpo Americas 2018, to be held in Rosemont, IL, from Sep 25 to 27. Teslin substrate is a highly printable synthetic material that is suitable for applications which demand a high-performing tough material. It is available in four standard label varieties —Ultimate Bond, General-Purpose Permanent, BS 5609-Certified and General-Purpose Removable. It can also be produced in custom configurations for any label application. Teslin substrate contains micropores that absorb toners, inks, coatings and adhesives. The product also enhances the security and durability of printed texts through its ability to absorb and lock in inks and toners with no additional processing. This unique feature makes it ideal for applications like brand protection, GHS-compliant chemical containers, medical/pharmaceutical products, tamper-evident security and high-end wine and spirits. It is compatible with print technologies which include digital inkjet, laser, offset and thermal transfer to flexographic. It also offers bubble-free application which provides a long-lasting adhesive bond that can bear extreme conditions. Teslin’s static-dissipative nature helps minimize static buildup during digital printing while improving print quality and throughput. Shares of PPG Industries have gained around 6.3% in a year, outperforming the industry’s 0.8% rise. In the second quarter, PPG Industries’ Industrial Coatings segment sales and total sales volumes improved year over year. Acquisition-related sales contributed to the growth. PPG Industries, during its second-quarter call, said that it does not see any respite from inflationary cost pressure in the third quarter. The company expects to continue its earnings-accretive cash deployment in the second half of the year. It is committed to deploying $2.4 billion of cash on acquisitions and share repurchases in 2018. The company also initiated a restructuring program and expects it to deliver annualized savings of roughly $85 million, once it is fully implemented. 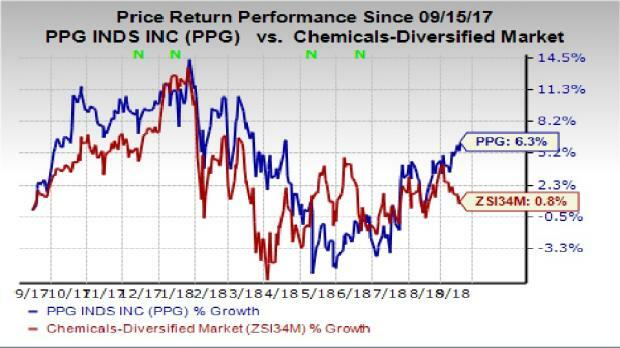 PPG Industries currently carries a Zacks Rank #3 (Hold). Some better-ranked companies in the basic materials space are Celanese Corporation CE, Ingevity Corporation NGVT and Air Products and Chemicals, Inc. APD. Celanese has an expected long-term earnings growth rate of 10% and sports a Zacks Rank #1 (Strong Buy). The company’s shares have gained 13.1% in the past year. You can see the complete list of today’s Zacks #1 Rank stocks here. Ingevity has an expected long-term earnings growth rate of 12% and flaunts a Zacks Rank #1. The company’s shares have rallied 72.1% in the past year. Air Products has an expected long-term earnings growth rate of 16.2% and a Zacks Rank #2 (Buy). The stock has gained 11.7% in a year’s time.